On the morning of August 17th, 2017, the ~3500 people who were a part of Decentraland community woke up excited. It was finally the day of the Decentraland ICO, or Initial Coin Offering. This was ultimately the first opportunity for the community to make their stake in the wild west of the virtual world. Decentraland’s community was very unique. 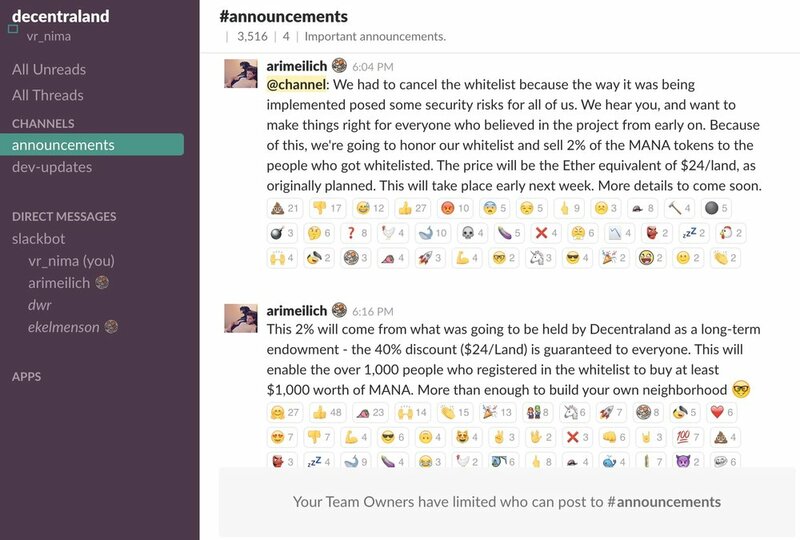 Unlike most other projects these days, the community around it was almost completely centralized, in a Slack channel controlled by the Decentraland team. It was one universal forum where everyone could talk to their future neighbors, business partners, and the creators of the virtual world themselves. About two hours before the ICO, the Decentraland team archived and locked all the channels except two that they control, #announcements and #dev-updates. This was very strange, they’d never told us they were going to do that before this point. It was very disconcerting not to be able to talk with our fellow community members while we approached the moment we’d all been waiting for. Despite this, everyone was still excited to buy in. The community had a huge amount of optimism in the project and a lot of love and trust for the development team. Because of that, the community wanted to put their money where their mouths were to prove they were invested in Decentraland’s long-term success. This was important because of what Decentraland is. It’s a fully decentralized virtual world. It was important because none of it had any inherent value. Decentraland, and it’s cryptocurrency MANA, was only as valuable as people made it. But within the first 10 seconds of it’s coins existence, the value to it’s community tanked. 5 large investors, known as “whales”, were able to buy in early to the ICO. Though many of the details are unkown(one whale seems to be a known smart-contract pool), it looks like collusion with the creators of Decentraland, as one 10,000ETH(~$3,000,000) purchase was allowed to occur 3 hours before the start of the ICO(a partnership with an app, apparently). Thus, a small handful of MANA-holders (last time I checked it was up to nine from five) took full control of Decentraland. Meaning 99.7% of Decentraland’s community had absolutely no stake in Decentraland. It was clear that we didn’t want to buy in to a project that was controlled by a select few, after being stabbed in the back by the team we trusted. Currently, people are discussing ways to take power back from Decentraland. This includes things like hashtag campaign’s(#decentraland #boycottmana), identifying issues with Decentraland, and presenting proposals for what to do going forward. We’re a small splinter community, but we’re working hard and fast moving forward. In less than 24 hours we’ve had hundreds of contributions from dozens of users. I presented a proposal to the #dev channel, and we’re doing our first survey to design the democratic process of a decentralized metaverse. So with all these red flags, why didn’t I warn people? Two fundamental reasons, firstly, the Decentraland community was so optimistic and positive, that they reacted badly to people asking critical questions on the community Slack channel. Secondly, I wanted to make money. Spending my time and energy to warn people would make them less likely to buy in. So instead, I prepared to buy in to the ICO weeks in advance, and planned on releasing a bunch of content to increase awareness around Decentraland(and help solve all of the complaints I had with the project) after I’d bought in. In fact, hundreds of people were planning on doing the same thing. Instead, most of those people have already left the Decentraland community. As far as they’re concerned, it was a scam. And it’s a damn shame, because this was the closest thing to an open metaverse we’ve ever gotten.